Acea Virtus Roma (SerieA) cut 24-year old Somalian international guard Faisal Aden (193-89, college: Washington State). In 6 SerieA games he averaged just 2.0ppg this season. Aden also spent pre-season at Texas Legends in D-League earlier that year. 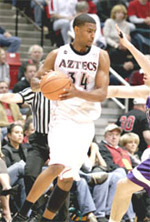 Last year he was drafted by Santa Cruz Warriors (D-League) in third round (45th overall). The former Washington State star is in his first season in pro basketball. Aden was called to Somalian Senior National Team this year. He has played also professionally in Belgium (Leuven Bears). Aden's game is described as: A slim bodied but strong and athletic perimetral player, he can spend time in all positions from 1 to 3, but gives his best at the SG. Likes to have the ball in his hands and shoots lots of times, most of them hitting the basket. Needs to improve his defensive skills to become a good pro player. On Jan. 25, 2013, in a game of his Team Somalia vs. Rwanda, he scored 59 points, setting the new FIBA record for a sinfle, international game.